A compelling novel that touches upon the hardships that refugees face and their resilience in the most dire of situations, “celebrat[ing] the human spirit and inherent kindness” (School Library Journal). My story starts the day that my parents told me we must leave our adopted home forever. Because of the soldiers and the drought we barely had enough to eat and we could no longer stay to help the people in our village. The journey would be hard—to cross the mountains and get to the safety of the border and the people there who could help us. But right before we were leaving, I saw a fish in a small brown puddle and I knew I had to take it with me. Yet when I put the fish in the pot, I never realized what we would have to face. It never occurred to me to leave Fish behind. 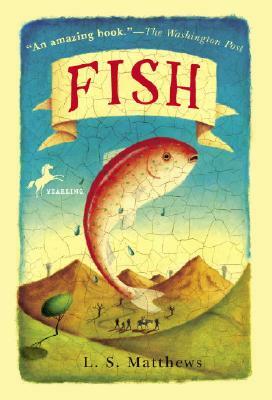 A subtle and sophisticated exploration of life, the strength of humanity, and survival in an unforgiving world, Fish is a story that will teach those who doubt that, when hope is almost extinguished, miracles can happen.